Deep beneath the stormy seas of Neptune, great cities loom majestically in the shimmering twilight of a vast and beautiful water world. Here the mighty Triton peoples live. 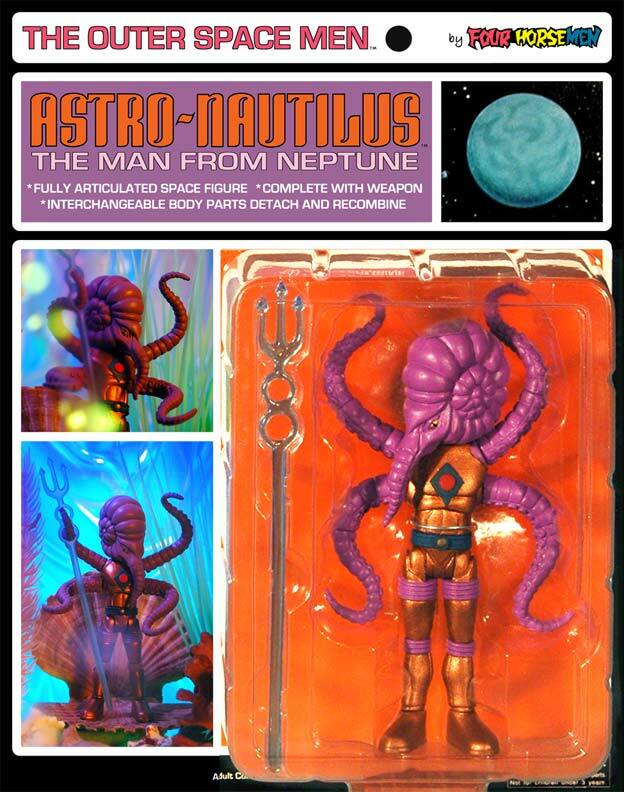 Not content to see the sun as but a glimmer and the stars as tiny ripples floating on the surface of the sea above, ASTRO NAUTILUS and his band of Triton mariners venture forth to sail and chart that greater ocean, Outer Space. 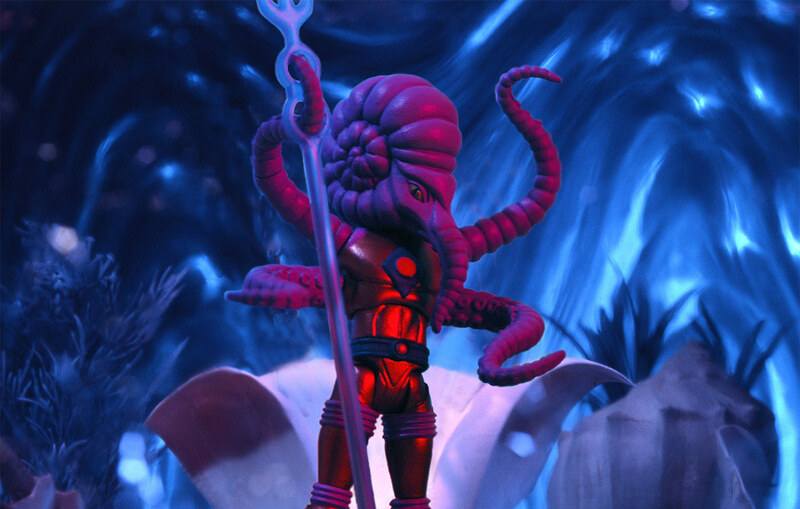 Often visiting our planet, they land, secretly, without all human knowledge, in the very depths of Earth’s great oceans. 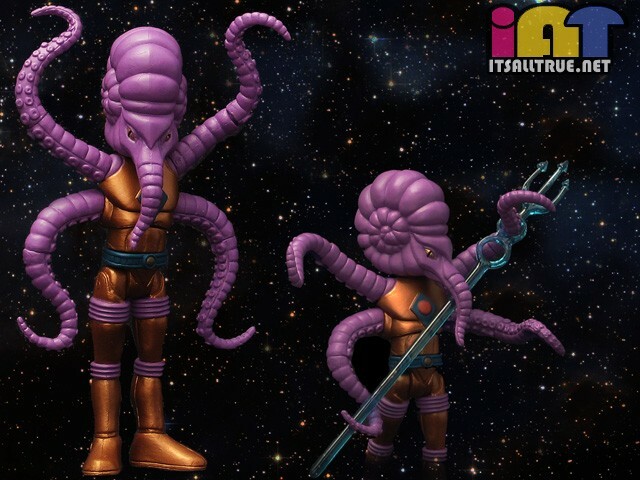 How do I love the NEW Outer Space Men? Let me count the ways: First of all, I love the look of them. The Four Horsemen not only captured the ambiance of the originals, they actually improved upon them. Secondly, I love the size. When it was proposed that, for a variety of reasons, they needed to be smaller, I must admit that part of me was a "little" disappointed. But, having learned the lesson, long ago, that HALF of SOMETHING is better than ALL of NOTHING, I readily agreed. Nine months later, when I saw the painted figures in person, for the first time, I could hardly believe my eyes. 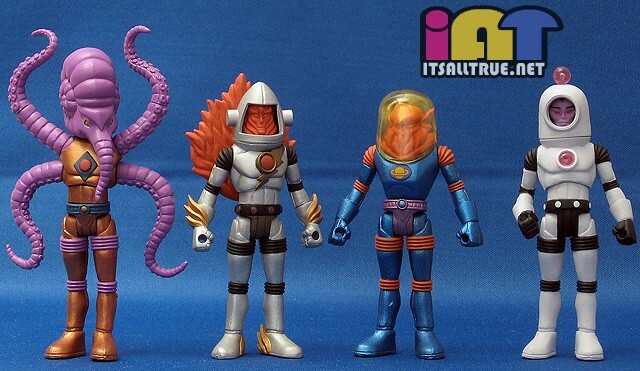 These are not your standard 3 ¾” action figures; they are a whole new size, meticulous masterpieces of miniaturization, made all the more miraculous by the realization that they were sculpted actual size. 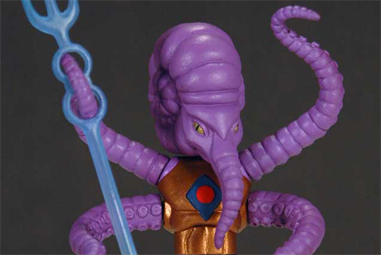 The Four Horsemen often sculpt a figure “two times up”, twice as big as they finished toy will be. Then the pattern maker shrinks it down to size. But these amazing figures were sculpted in a ratio of one to one. Ironically, the awesome detail of these pristine perfect images holds up, even when they are enlarged to three times their actual size, as can be seen, above. I’m afraid, throughout this process, I gave the Four Horsemen a hard time. The size and clarity of the working photographs they sent me disguised the fact that the actual figures were so tiny. Thus, as the following pages will show, I held the sculptures to a standard that would apply if they were two feet high. Nonetheless, the Four Horsemen met that standard, in spite of the size. If I had realized the sense of wonderment the final figure’s physical presence conveys, I might not have been so demanding. After all, when one manages to inscribe the Lord’s Prayer on the head of a pin, one does not criticize every nuance of the type. Yes , size does matter! And in this case, forgive the cliché, "Less IS More!" 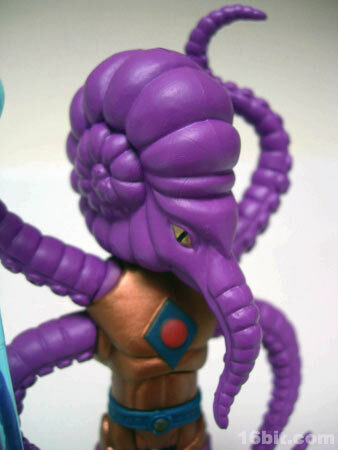 Last of all, I love the controlled articulation of these figures., Astro Nautilus is a perfect case in point. 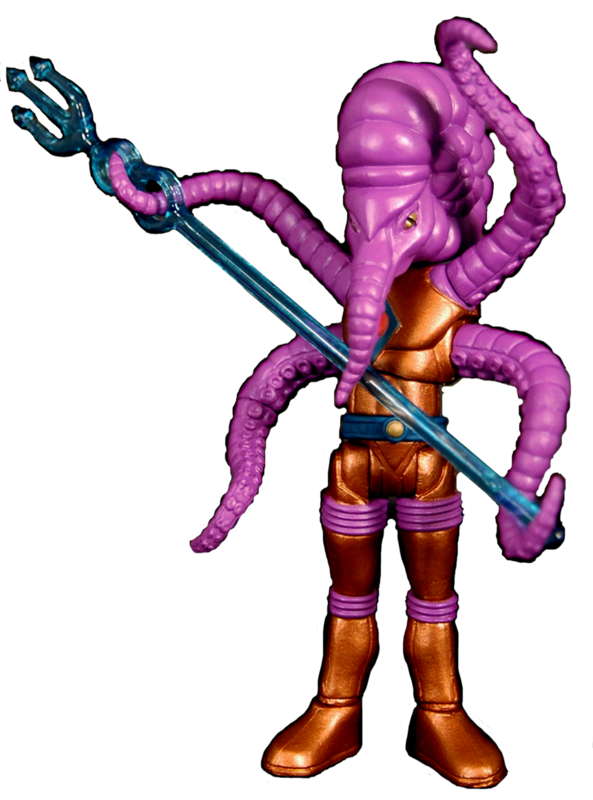 In theory, the 1968 bendy figures promised limitless possibilities for pose-ability, but the fact is, I have never seen Astro Nautilus’s tentacles posed convincingly by anyone, but me! 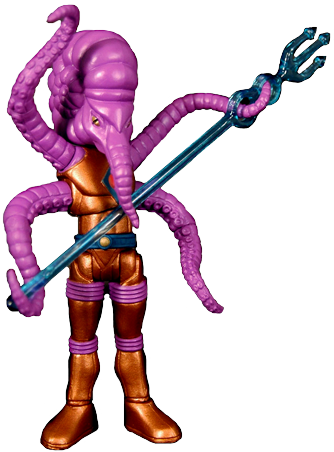 On the other hand, the double jointed tentacles of the Four Horsemen’s version, can be posed in an infinite variety of positions, and every one of them is interesting! The following photos were gathered from the Internet. Each represents a REVIEW. Clicking on each Photo will carry you to its original source.